The M18 FUEL < inch Hex Impact Driver is the Most Powerful Tool in its Class. At 1800 in-lbs of fastening torque, this tool drives screws faster but also provides greater control over power and speed thanks to its proprietary 4-mode DRIVE CONTROL. The POWERSTATE Brushless Motor delivers up to 0-3,000 RPM with constant power output to drive screws faster. REDLINK PLUS Intelligence is the most advanced electronic system on the market, preventing damage to the tool and battery caused by overloading or overheating. REDLITHIUM XC5.0 Batteries deliver more work per charge and more work over the life of the pack than competitive batteries on the market. The Bosch 12 V Max I-Driver offers 80 In.-Lbs. of torque with a 3.5 In. total head length. The 90 degree articulating head rotates and locks into 5 positions for increased versatility. This compact size and versatility makes the PS10 the perfect for working in tight spaces. The electronic clutch makes this a perfect tool for installers. Compatible with all Bosch 12V Max Lithium-Ion batteries. With its compact design, the DEWALT MAX 1/4 in. Cordless Impact Driver Kit fits into tight places that traditional impact drivers can't. It weighs 2.3 lbs., making it easy to lift and handle, and features conveniences like three LED lights for shadow-free working, 1-handed loading and a handy belt clip for portability. It's ideal for cabinetmakers and HVAC professionals, as well as electrical, mechanical and general contractors who perform overhead fastening applications. DeWalt's 20V Cordless MAX Lithium-Ion Premium 1/4-inch Impact Driver is designed for convenient one-handed loading of the 1/4-inch hex chuck that accepts 1-inch bit tips. The driver also offers three LED lights with a 20-second delay after trigger release and a 1.5Ah battery. The DEWALT 1/4-inch 20V Cordless Impact Driver provides up to 1400-inch lbs. of maximum torque and delivers up to 2800 RPM and 3200 IPM for fast, efficient work in a range of fastening applications. 3 LED lights on a 20-second delay after trigger release help to illuminate dark work spaces. At only 5-1/2 in. long and 2.8 lbs. in weight, this compact impact driver packs a serious punch in a small-size package. 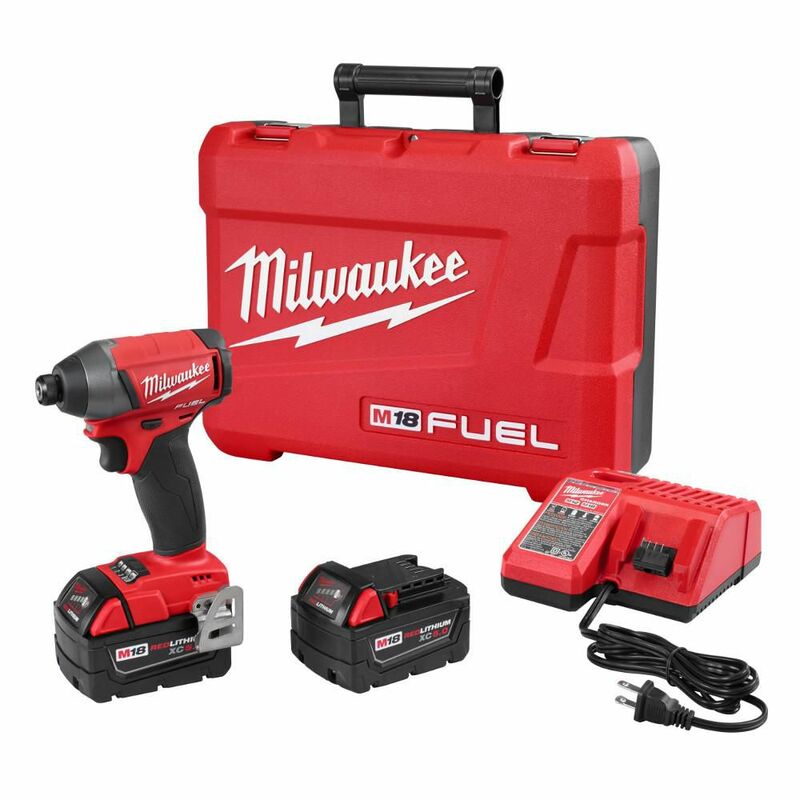 M18 FUEL 18-Volt Lithium-Ion Brushless Cordless 1/4-Inch Hex Impact Driver Kit W/(2)5.0Ah Batteries The M18 FUEL < inch Hex Impact Driver is the Most Powerful Tool in its Class. At 1800 in-lbs of fastening torque, this tool drives screws faster but also provides greater control over power and speed thanks to its proprietary 4-mode DRIVE CONTROL. The POWERSTATE Brushless Motor delivers up to 0-3,000 RPM with constant power output to drive screws faster. REDLINK PLUS Intelligence is the most advanced electronic system on the market, preventing damage to the tool and battery caused by overloading or overheating. REDLITHIUM XC5.0 Batteries deliver more work per charge and more work over the life of the pack than competitive batteries on the market. M18 FUEL 18-Volt Lithium-Ion Brushless Cordless 1/4-Inch Hex Impact Driver Kit W/(2)5.0Ah Batteries is rated 4.8 out of 5 by 29. Rated 4 out of 5 by Pappy from Awesome driver! Drives 6” timberlock screws into 6x6 with no problem. Had to return the first on... Awesome driver! Drives 6” timberlock screws into 6x6 with no problem. Had to return the first one I ordered due to wobble in the chuck. Took back to local Home Depot and they exchanged impact driver with no hassle. Second one has no wobble. Batteries seem a bit loose when attached to driver but still work fine. Overall a great machine! Rated 5 out of 5 by Greg from This drill is amazing. The only thing I dislike is the position of the reverse switch. My hand se... This drill is amazing. The only thing I dislike is the position of the reverse switch. My hand seems to keep switching it at the most inopportune moments. Rated 5 out of 5 by Juni from Bought this after countless researching and I am very pleased.I'm a diy and know this driver will... Bought this after countless researching and I am very pleased.I'm a diy and know this driver will handle any projects I might decide to take on.It feels good in my hand as far weight, design go.It has plenty of power and a great case.Also comes with two batteries and a charger.All and all a great buy. Rated 5 out of 5 by Isaac from Excellent product. ... Excellent product. Rated 5 out of 5 by Nate from Just Right I have used this impact for 1 year now for around the house & automotive applications, most of the time was installing cabinets. Power enough for most automotive applications up to 120 ft lbs & size is small enough for tight cabinet spaces (sink harness, under granite with minimal space). With the 4 selectable modes it is hard to justify (for my needs) another driving tools which delivers such compact performance.